Shah Rukh Khan took to his official Instagram account and shared the first look of his upcoming film 'It Happened One Night'. The film stars Sidharth Malhotra and Sonakshi Sinha in the lead roles. The post has an intriguing look of Sidharth in which he is seen wearing handcuffs and his close up look is intensely catchy. Karan Johar who is co-producing the film shared the following image on his Instagram handle. The film's three leads Sidharth Malhotra, Sonakshi Sinha and Akshaye Khanna all have intense looks. The film will be produced by Shah Rukh Khan’s Red Chillies Entertainment, Karan Johar’s Dharma Productions and BR Films. This would be the first film in Sidharth Malhotra and Sonakshi Sinha will be seen together onscreen. 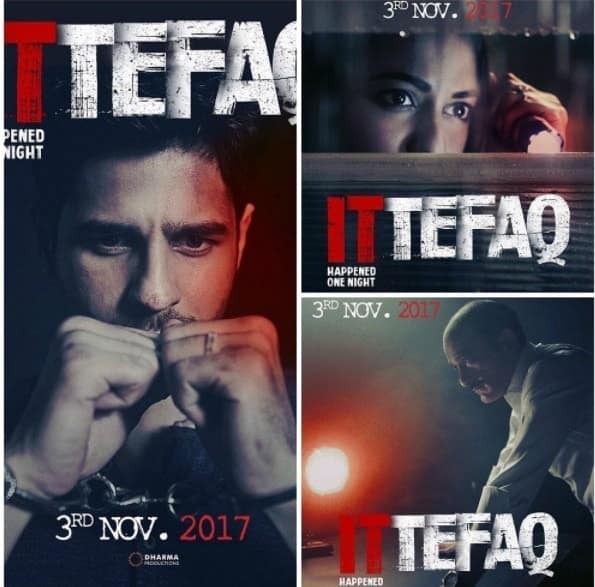 The movie had been in talks for quite some time and its original title was 'Ittefaq' but the first look now reveals it to be 'It Happened One Night'. It is to be noted here that this film is the official remake of 1969 hit film 'Ittefaq' which starred Rajesh Khanna, Nanda and Sujit Kumar. It was about a painter who was extremely passionate about her work and loved his painting more than his wife. When his wife destroyed one of his paintings he threatened to kill her and left the house. On returning he found out that his wife was already dead and the police then arrested the painter. Fans would be eager to see if there is any twist in the remake and that if 'It Happened One Night' would unfold on the same plot. Directed by Abhay Chopra, grandson of BR Chopra who is famous for making the hit TV serial on the Indian epic Mahabharata, 'It Happened One Night' is scheduled to release on November 03 as per the poster.